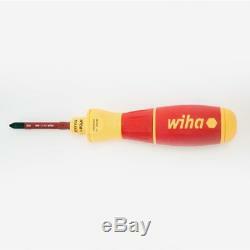 Wiha 32480 speedE Insulated Electric Screwdriver with SlimLine Blades. Wiha insulated electric screwdriver - speedE Full protection - slimLine blades tested at 10,000 V AC and approved for 1,000 V AC Certified to ASTM, IEC, VDE, EN, ISO, NFPA Increased control - Fixing by hand with full sensitivity Increased efficiency - Electronic ratchet for rapid fastening without any re-gripping Material protection - Electric fastening with a protective function to prevent damage to materials max. 0.4 Nm = 3.5 in/lbs. Easy storage - L-Boxx mini storage solution for tradesmen and service professional that are always on the move. Perfect for holding the speedE screwdriver and all the speedE accessories. Description Anyone who spends much of the day fastening screws knows how much time it takes and the strain it causes to wrists over time. With the world's first e-screwdriver speedE® by Wiha, such problems become a thing of the past. With the speedE®, you fasten screws twice as fast when compared to a conventional screwdriver and still have full control over the tightening force. On reaching 0.4 Nm (3.5 in/lbs), power-assisted fastening switches off automatically to protect the material and users can finish fastening carefully by hand. Thanks to its electric ratchet function and award-winning SoftFinish handle shape, the speedE® noticeably reduces strain on joints, tendons and muscles. It is recommended by German doctors and therapists at German Campaign for Healthier Backs for this very reason. The integrated LED light shines directly onto the screw and work piece that the user is working on. The e-screwdriver improves everyday efficiency, particularly due to its compact design. The user can expect to fasten at least 800 screws with its standard 18500 batteries, when fully charged. It can also handle numerous different screw profiles when used in combination with Wiha slimBits. In combination with the VDE certified slimBits the speedE® offers electricians full protection during their daily work. Application Ideal tool for all screw-fastening tasks, such as: Power socket installation Work in switch cabinets Industrial maintenance and installation Motorized equipment maintenance and repair Household appliances and white goods Window and door installations Heating, air conditioning and plumbing installation Bicycle, motorcycle and lawnmower repairs Also perfectly suited for furniture assembly, repairs and other fastening tasks related to hobbies in the home. Kit includes: L-Boxx mini storage box speedE Handle SlimLine Blades, 8 pcs Slotted: 3.5, 5.5mm Phillips: #1, #2 Square: #1, #2 Terminal Xeno: #1, #2 USB smart battery charger - with LED charging indicator 110 Volt adapter wall plug 2 x 18500 Li-Ion batteries. Wiha Tools No Hassle Guarantee. Wiha branded tools are regarded as the most durable, best designed and highly innovative products around. Our tools are used by demanding professional tradespeople and tool aficionados alike. They are meant to be used and utilized often. Rest assured, if for some reason there is a defect in material or workmanship we will replace your tool free of charge for as long as you own the tool. Exclusions Wiha Tools has the right to exclude bits, Tweezers and Ceramic Screwdrivers. These products are either consumable or wear easily. All torque tools are designed to be re-calibrated after 5,000 cycles or 1 year (whichever comes first). Legal Some areas do not allow the exclusion or limitation of incidental or consequential damages, so the above limitation or exclusion may not apply to you. This guarantee gives you specific rights, and you may also have other rights, which vary, from state to state, province to province, or country to country. This No Hassle Guarantee is the sole and exclusive guarantee for the Willi Hahn Corporation dba Wiha Tools. No employee, agent, dealer, or other person is authorized to alter this guarantee or make any other guarantees on behalf of Wiha Tools. The item "Wiha 32480 speedE Insulated Electric Screwdriver with SlimLine Blades" is in sale since Friday, January 18, 2019. This item is in the category "Home & Garden\Tools & Workshop Equipment\Hand Tools\Screwdrivers & Nutdrivers". The seller is "kctoolco" and is located in Olathe, Kansas. This item can be shipped to United States, Canada, United Kingdom, Denmark, Romania, Slovakia, Bulgaria, Czech republic, Finland, Hungary, Latvia, Lithuania, Malta, Estonia, Australia, Greece, Portugal, Cyprus, Slovenia, Japan, China, Sweden, South Korea, Indonesia, Taiwan, South africa, Thailand, Belgium, France, Hong Kong, Ireland, Netherlands, Poland, Spain, Italy, Germany, Austria, Bahamas, Israel, Mexico, New Zealand, Philippines, Singapore, Switzerland, Norway, Saudi arabia, Ukraine, United arab emirates, Qatar, Kuwait, Bahrain, Croatia, Malaysia, Brazil, Chile, Colombia, Costa rica, Panama, Trinidad and tobago, Guatemala, Honduras, Jamaica, Viet nam.